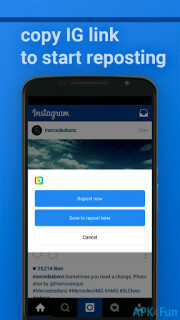 Repost is the original &amp; the oldest app to repost Instagram on the Play Market. Millions of people worldwide already joined Repost family and repost Instagram photos daily. Now you can repost photos so cool you'll never do with any other app. Become a photorepost monster: repost repost repost! Use this photo repost app everyday and repost Instagram pics to your Instagram. We provide you with the latest high-end industry technology to work with videos, so you can repost videos you&rsquo;ve found with your followers.